This Free YouTube Video Downloader always works with YouTube latest upgrade! Free download YouTube videos FLV, MP4 and Webm, download YouTube 3D videos, save the downloaded videos to your computer hard disk, and then play them with the system media player. Download all YouTube HD videos, even 1080p HD and 4k videos, and it's all for FREE. Download YouTube videos FLV, MP4, and Webm directly to PC at high speed. Download YouTube 3D videos easily. Directly download YouTube HD videos, even 1080p HD videos and 4k videos to your computer with this YouTube downloader. Quickly download multiple YouTube videos at one time. Convert YouTube videos to MP3, AVI, MPEG, MP4, 3GP, MKV, and other formats, or convert YouTube videos to be compatible with iPhone/iPad/ iPod, Apple TV, Galaxy, HTC One, Moto X, Nexus, Kindle, Surface, Lumia and other devices. It can also support "Automatically Convert" option to one-step download and convert YouTube videos. Add the function to convert YouTube videos to other videos. Add the function to convert between all your local videos in different formats..
Support downloading YouTube videos of different resolution ratios. Choose the option “Automatically Convert” to let this YouTube Downloader directly convert the videos after downloading. Check for software updates automatically at any intervals you choose. Super fast and efficient way to download YouTube videos you like! 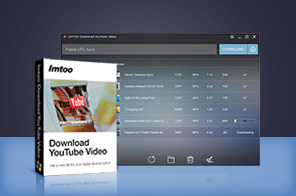 This free YouTube video downloader software has easy to use interface. Multiple language options: English, German, Japanese, French and Chinese. Nokia Lumia 920, Nokia Lumia 925, Nokia Lumia 928, Nokia Lumia 1020, Nokia Lumia 720, etc.BlackBerry Z10, BlackBerry Q10, etc. Tutorial : How to download videos from YouTube , download YouTube HD videos with ImTOO Download YouTube Video?